Happy Bloggers Challenge Friday! Thanks to those who played along with the Bling it On Challenge, I'll be around this weekend to leave comments! The challenge this week is Mother's Day (celebrate Mom/Grandma/Aunt/a Friend - you get the idea). 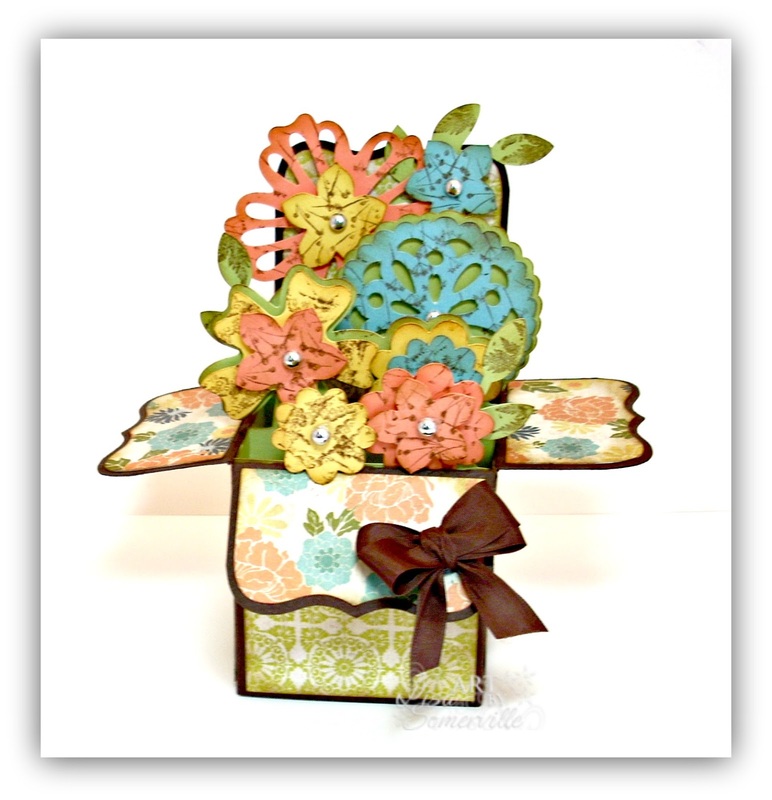 I used SVG Cuts Box Card Kit to create a gift for Mother's Day. The box panel are covered with My Minds Eye Indie Chic pattern papers. To add interest to the flowers I randomly stamped images from the Artistic Outpost Generation Redux plate using Cocoa ink. If you'd like to play along with this weeks Bloggers Challenge, please link back to this post on your blog and mention you created your card for the Bloggers Challenge Mother's Day Challenge. Please add your link using the Link Tool below, your link should be a direct link to your Bloggers Challenge Post, use your name as the Title. Please do not link to cards that were created prior to the challenge date. Entries not linking properly, or backlinked will be removed. If you have the captcha enabled on your blog, please consider turning it off, as it makes it so much easier to leave comments. How fun! Love the flowers popping out of the box. I haven't tried one of these yet, but I may just need to give it a try over the weekend. Absolutely incredible! This is the most awesome card ever and I think your mother will really be surprised. She knows you and has seen your talent, but you've surpassed everything here! I love these fun boxes and this SVG die is so great! Fun project! lovely Lisa - they are a lot of work, but they are so much fun to look at, the recipients love them. That is an amazing box card!!! I love it!!! Gorgeous papers!! Thanks for another fun challenge!